Ketchikan, Alaska - A killer, a convict, and a medical guinea pig. A printer, a chef, and a toy store owner, a fisherman, a gambler, a conman. The list goes on and on because James E. Duncan was all of these things, and more. He was a man who exhibited either good or bad, but not much in between. Among other people he evoked love or hate, respect or distrust. Most of all he projected an air of mystery. During prohibition (1933), when Duncan was 20 years old and involved in a rum-running scheme, he shot and killed a "booze hijacker." He later said he warned the hijacker against stealing his booze, but when the man kept it up, Duncan killed him. Duncan was tried for murder, found guilty and sentenced to life in the New Jersey State Penitentiary. As an inmate Duncan showed promise, ingenuity and a desire to turn his life around. While in prison he started a business that grew to employ hundreds of inmates and earn $90,000 a year for the penitentiary, according to a Reader's Digest article written by former prison warden, John L. O'Hara. Duncan's business involved using plastic to make costume jewelry. To obtain enough plastic he collected old toothbrushes and melted them down. He threaded gold wire through the plastic and made pins in the form of girls' names. As demand for the jewelry grew, he and the warden began selling the pins to curio shops around the United States. Duncan told the warden he wanted to do more to help society and in that way redeem himself and his reputation. He convinced the warden to set up a hospital emergency ward for medical trials. During World War II more American soldiers were dying from tropical diseases than from the war itself and the Army desperately needed to find treatments and cures. Duncan volunteered as a human guinea pig for five different trials, receiving injections of sleeping sickness, dengue fever and sand-fly fever. From each disease Duncan grew gravely ill and nearly died. But each time he recovered his strength, survived and-finally-earned a parole from prison. 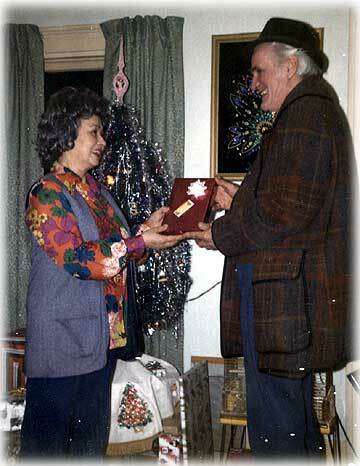 In 1946 Duncan arrived in Ketchikan to work for magazine publisher and curio-store owner, Emery Tobin. During the war Duncan had sold Tobin thousands of pieces of prison-made jewelry, which Tobin in turn sold to Alaskan soldiers and from which he made thousands of dollars! Tobin hired Duncan to work as a pressman at The Alaska Sportsman Magazine. Duncan was a hard worker and Tobin soon promoted him to advertising manager. "Jim Duncan is a friend of mine," Tobin wrote later. "And I believe it would be difficult to find a soldier who has exhibited more courage. While in prison he demonstrated inventiveness, initiative and industriousness second to none. He is intelligent and aggressive and has worked hard to make money, both in and out of prison." At this time Duncan was a lean, handsome man with a clean-shaven face, firm jaw, blue eyes, broad smile and full head of dark wavy hair. (In later years he wore large glasses and grew a full white beard. But he had a reserved and intimidating manner about him. "He was a tough one to figure," recalled longtime Ketchikan resident Barbara Hassell, who worked at The Alaska Sportsman when Duncan did. "He was so austere and unapproachable. He was always mysterious and going just around the corner out of sight as quickly as he could. As a young girl I was scared to death of him." In 1947 Duncan left Tobin's employ to open and operate a small "hamburger joint"- as former customer Clayton Benner referred to it-which was called "Curb Lunch," located on Mission Street across from the federal building. Duncan specialized in "big juicy hamburgers with real French fries for forty-five cents," recalled Benner, who hung out at hamburger joint as a teenager in 1947. Benner added that the Cokes back then cost about a dime! Always, rumors of shady dealings swirled about the Curb Lunch (when it was owned by Duncan as well as later). In the dark of the back room, illegal pin ball machines operated and business men came at night to roll dice, play cards and meet with "ladies of the evening" who lived on nearby Creek Street. After living next door to the restaurant for a time Duncan moved to a house on Inman Street, a "stair street" located off Stedman Street, above the Thomas Basin boat harbor. He became involved with a different crowd of people than those at the magazine and experimented with new and different ways to make money. He started a business called the Alaska Advertising Agency, which he described as an "information service." He also began driving cab and working swing-shift at the Ketchikan Pulp Mill. Then he invented a new, supposedly-fascinating product, described in the local newspaper as a "type of synthetic clay that permits mineral-type baths in the home." One of Duncan's friends, Ed Short, wrote a letter-to-the-editor of the Ketchikan Alaska Chronicle, extolling the virtues of the product. But when Duncan tried to enlist other local businessmen to help him market his "Desert Springs Mineral Baths," some wrote letters-to-the-editor, distancing themselves and claiming they did not want to be associated with Duncan. By this time Duncan had earned a reputation as a somewhat shady character and "member of the underground," according to Tobin. The '40s and early '50s were a time of live and let live in Ketchikan. Nightclubs, bars and bawdy houses proliferated and drinking, gambling and prostitution went on almost unrestricted. Police officers, when called to investigate a crime, often winked and looked the other way. Some even joined in the fun! Tobin had started a campaign to crack down on vice and to "clean up" Ketchikan and Duncan assisted by "funneling information to the campaign from the underground," according to Tobin. The chief did not like Tobin's campaign or Duncan's role in it. In 1954 the police department succeeded in bringing a charge of robbery against Duncan. The crime was reported by former bawdy-house operator and then-current Arctic Bar owner, Josephine Hill, who accused Duncan of stealing $25,000 from her home near Bugge Beach. Hill claimed the money had been kept in a cedar chest in her bedroom and someone had broken in and taken it. Duncan knew it was there, she said, because he once had driven her home in a cab. Duncan landed in the local jail. It's not clear if he actually committed the crime or not, but Emery Tobin believed in Duncan's innocence and defended him to the end. Tobin's consistent refrain was that Duncan had been framed by "underworld characters." "Duncan was associated with me and the underworld believed he was supplying information to me and now they are getting back at me through him," Tobin claimed. Duncan hired well-known defense attorney Robert Ziegler. During a preliminary hearing-which was described by the Ketchikan Alaska Chronicle as "the meeting of two fabulous personages for over two hours," referring to Duncan and Josephine Hill - Ziegler won a release for Duncan on $30,000 bail, reduced from $60,000. 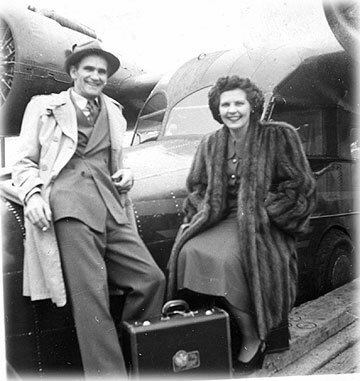 In a huge front page story the next day the Chronicle described Duncan as "the suave, jut-jawed, wise-cracking former advertising manager of Emery Tobin's Alaska Sportsman Magazine," and Josephine Hill as "the diamond-wearing Mrs. Hill, the colorful operator of the Pioneer Rooms and the Arctic Bar, who has had a few brushes with the law herself." Later a grand jury voted "no true bill" on Duncan's case. The charges were dropped and Duncan walked away a free man. Finally after six weeks in jail Duncan was able to get back to business. He worked hard at his advertising and mineral-bath companies and continued to drive cab. He also opened and operated a small toy store, located in the Ingersoll Hotel building on Mission Street. 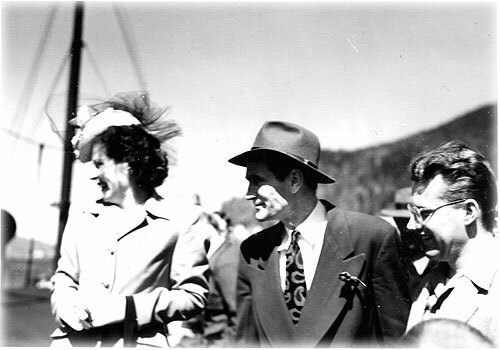 But by 1955 Duncan had had enough; he had married and divorced and grown tired of Ketchikan. The robbery charge, though dismissed, had cost him time and money and still haunted him. He decided to return to his home state of New Jersey. He spent a few years operating an amusement park called "Story Land" on the Jersey coast and at least one summer managing a yacht club. In 1958 he moved west to California, taking a position at a "dairy bar" in Disneyland, an operation owned by the American Dairy Association. Later in northern California Duncan managed a ski resort. But as the years passed Duncan missed Ketchikan and its people and fishing opportunities. He had sport-fished every year and entered the king-salmon derby every year and usually won a prize. He came back to town, bought a commercial fishing boat, and became a professional long-liner and crab fisherman. "He would tie up at Ryus Float and keep his crabs in holding pots on his boat. He would sit at the Sourdough Bar and sell the crabs from there," Athorp recalled. "He sold red snapper from the bar too." Duncan also sold halibut and black cod to restaurants around town, earning himself the nickname "250 Fathom Jim." Some restaurants and clubs even hired him as a chef so he could make and serve his favorite "deep-fried black cod cheeks," according to old-timer Reub Crossett who hosted an annual "wild fish and game" dinner in Ketchikan. Duncan moored his boat at Thomas Basin. Above the basin sat the Potlatch Bar, where most fishermen hung out in their spare time - but not Duncan. The Potlatch was owned by his archenemy, Josephine Hill. It was not until after her death that Duncan began frequenting the bar and later rented rooms upstairs, where he set up his "headquarters," according to Athorp. There were rumors of illegal gambling and card games that took place there at night. He married again. His new wife was a local lady and a longtime friend, Janet Campbell Duncan, who worked as a matron at the Ketchikan Children's Home. After many happy years together, in March of 1983 at the age of 68 Duncan died. In May of that year the Alaska State Legislature issued a proclamation that read: "In Memoriam: James Edward Duncan," which described Duncan as a "remarkable Alaskan Pioneer, a man of amazing abilities and endless courage." The proclamation continued: "Jim Duncan's life story is a fascinating study of how a young man, facing a lifetime of unhappiness, gathered the courage and will to not only survive, but to share his talents, compassion and genuine warmth with others. He will be missed along the sidewalks and waterfront of Ketchikan." The proclamation, signed by Duncan's former defense attorney and then - State Senator Robert Ziegler, exemplified the goodness of James Edward Duncan. But even in death his bad reputation haunted him. Stories still circulate about the robbery of Josephine Hill. Some folks believe he did steal money from her. Others say someone else stole the money but Duncan drove the get-away car. Still others claim that a man and wife, friends of Duncan's, stole the money (which consisted of a lot of large recognizable bills that had been stashed in a cedar chest for years) and then smuggled it out of town in a baby carriage. Some say that Josephine Hill lost no money at all; she and her underground friends simply concocted the crime as a way to frame Duncan and get back at him and Emery Tobin. Other rumors swirl about Duncan, the con artist and smooth talker, who frequented bars, drank whiskey, told whopping lies, swindled his friends, and cheated at dice and cards. Conversely, he is remembered for his charm, intelligence, positive business attitude, adventuresome spirit - and mysteriousness. Athorp, Fred. Interviews, Ketchikan, AK: June, 2005. Benner, Clayton. Letters via e-mail: 2005-2007. Crossett, Reub. Reub's Fifteenth Annual Alaska Game Dinner Menu, Ketchikan: 1976. Duncan, Janet. Interview, Ketchikan, AK: June 2, 2007. Francisco, Toni Wick. Letter via e-mail: August 16, 2007. Hassell, Barbara. Letter via e-mail: January, 14, 2005. Ketchikan Alaska Chronicle, Ketchikan, AK: March 9 & 10, 1953. Ketchikan Daily News, Ketchikan, AK: March 13, 1958. Larson, John D. Notarized letter, Ketchikan, AK: April 2, 1954. O'Hara, John L. "The Most Unforgettable Character I've Met," The Reader's Digest, May, 1948. Tobin, Emery. Personal papers and letters, Ketchikan, AK: 1954, 1955.